It’s the twenty-second century. The United States has become the Democratic Unity of America or “the Unity.” The privileged typically work for the militarized government and indulge in superficial activities like drug taking and getting their bodies altered. The have-nots live on the outskirts and are seen as ruffians by those in the Unity. When tough, young Second Lieutenant Malila Evanova Chiu is taken hostage by the “savages” of the Unity’s outskirts, she is treated to a journey of harsh truths about the world they all live in. Boutwell has created his own version of the future, full of hardships and illusory imagery. Like other novels of the dystopian future, this one addresses the notion of government control, the increased role of the military, and the plight of day-to-day citizens living in such a world full on. Though, on the surface, the book is somewhat typical of other futuristic tales, Boutwell adds certain aspects that make Outland Exile unique. Lieutenant Chiu is the first of these, as the foulmouthed female protagonist brings humanity to the book. Despite her tough exterior, her withdrawal from the soma-like ThiZ in front of her captors—“She had never gone as long as two days without ThiZ. … Her nausea came in waves”—shows her to be more like them than the supersoldier the Unity has built her up to be. She and her friends in the Unity, such as the fired actress Luscena and the know-it-all Hecate, gossip and bring humor and irony to Outland Exile—“We lost the krill farms off Negzed. … Fatherfecking workers!” In Boutwell’s future, foul language has been changed to words like “feck” as a societal standard of profanity. That, coupled with the fact that paper books are contraband, indicates the oppression Outland Exile’s characters face. If characterization and the details of human life are Outland Exile’s highest attributes, the complicated jargon and extended societal details are what hinder it. While Boutwell has put a lot of work into creating his own world of the future, the overuse of abbreviations and terminology make the narrative hard to comprehend in the first seventy pages. Numerous codes like CRNA, OAA, and E11, S24 interrupt the flow of reading, making it more confusing, while fictional locations and groups explained in footnotes—“The Rampart was built just after the Scorching (October AU 3 to February AU 4) … The Solons proposed building [it]”—add further comprehension difficulties. 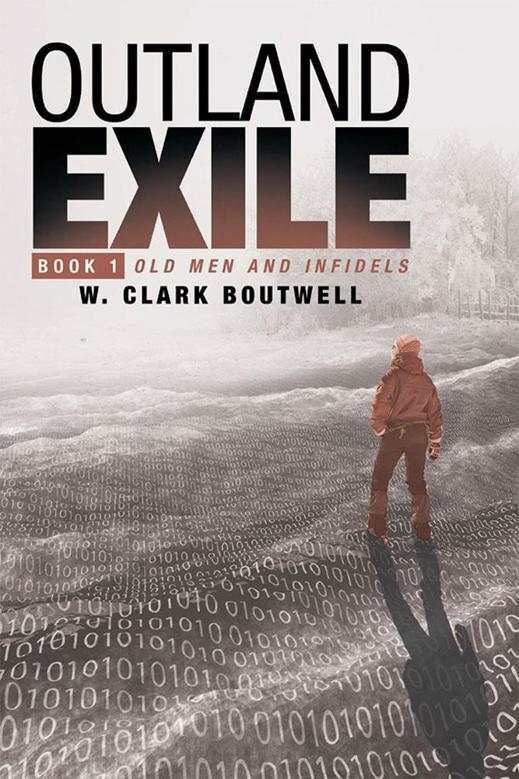 While a more streamlined approach to creating fictional world details might have helped Outland Exile be easier to understand, it’s nevertheless entertaining, and after the tenth chapter, its plot finds a groove of well-wrought text that creates its own version of how bad the future could be.